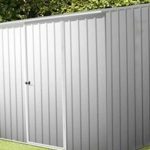 This is an exceptional quality 10 x 13 metal shed. The sheer size of the building can accommodate most tools and equipment. You can even store small vehicles in it if you want to. Along with a large storage space, it also has many great features including fire retardant safety panels, sliding doors and a hot dipped galvanised steel structure. This is a Yardmaster solid metal storage shed complete with a practical apex roof. The shape and design of the roof ensures any water runs down and away from the shed, minimising its risk of rust. Its unique shape also gives the inside of the shed extra head room. This means more storage space to store taller equipment or even small vehicles. It also adds a nice aesthetic appeal to the building, ensuring it looks good in any garden. One beneficial aspect of the shed is the size of its eaves. They measure 1.63m tall. With a roof height of 2.03m, you have easy and comfortable access into the shed. It also comes at a depth of 3.96m and a width of 3.03m. As for the doors, they measure 1.59m in height and 1.23m in width. Metal cladding is used to create an impeccably solid structure. Hot dipped galvanised steel coated in zinc helps to give the building an ultra-strong, weather-resistant design. This means no matter what harsh elements it is exposed to, the shed will remain unaffected. The steel design also runs through to the framing of the building. This means it provides exceptional support to the entire building, ensuring it won’t topple over or sag over time. 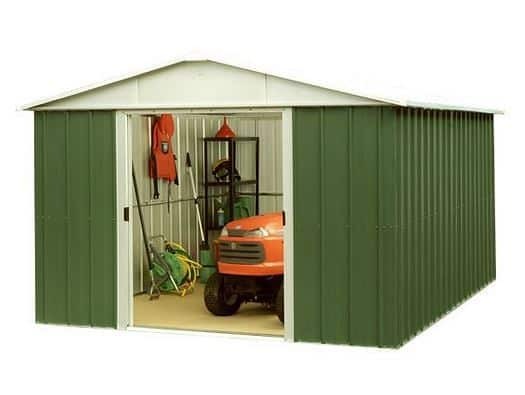 One consistent design feature of Yardmaster metal sheds is that they don’t come with a floor. The main reason for this is because they are designed to store very heavy tools and machinery. In some cases, like with this building, you can even store vehicles such as motorbikes. If it were to have a floor, it is doubtful it would withhold the weight of heavier items without causing damage. However, what this does mean is that it absolutely needs to be assembled on top of concrete or at the very least, pavement slabs. If you aren’t planning on storing small vehicles or exceptionally heavy machinery, you could also use timber decking. Nobody enjoys having to maintain their shed with regular treatments. So you’ll be pleased to know this shed doesn’t need any treatments at all. You don’t even need to treat the building before or after it has been built. 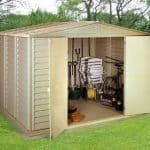 Compared to wooden sheds, this means you save a lot of money and hassle over the years. The fact that it doesn’t need to be treated doesn’t affect the durability of the shed either. You are still provided with a 10 year anti-rust guarantee. It even comes with rust free screws. Two large sliding doors are provided to give you very easy access into the building. The sliding feature also benefits you in windy weather conditions. There is no risk of them blowing shut as you’re attempting to move items in or out of the shed, adding to its safety. While they don’t slide all the way to the edge of the building, they do still provide spacious access enabling you to transport your items quickly and easily. This is a windowless design so if you plan on using it as a workspace you may need to install an electrical pack. Due to the seriously strong design of the shed, it is one of the most secure buildings you can invest in. The doors are lockable, ensuring you are the only one with access. There are no gaps anywhere in the exterior of the shed so everything you store is kept fully secure. With no windows for potential thieves to pry through, this also adds to the buildings security, as well as giving you a lot of privacy. This is an important feature if the things you will be storing are expensive. This shed doesn’t come with any customisation options, but in reality it doesn’t need them. 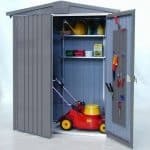 There is just one extra available with this shed and Waltons gives it to you free of charge. This free gift is an anchor kit. It helps to secure the shed to the base using tough, solid screws. It is very easy to install as the screws simply fit into the pre-drilled holes found within the base rails of the building. Worried about having to move the shed? As the screws can be removed whenever needed, you have peace of mind that you can anchor it anywhere you want to. This is great news if you decide to move house sometime in the future. As an extra thank you gift, Waltons also supply free gardening gloves. The shed boasts an impressive quality and has been created with both practicality and durability in mind. We like that not only is this shed affordable, but it is also constructed to last many years. The strong hot dipped galvanised steel is resistant to not only water, but fire and rodents too. Make no mistake – this is a very large building that offers great levels of storage space. It doesn’t matter what you need to store, there is a place for it in this secure shed. This isn’t a difficult shed to assemble, but it is time consuming. We’d expect that from a large building, but it is something to think about. What we really like is the fact Waltons have thought about safety too, ensuring the edges of the panels have been hemmed to make them safer to assemble. 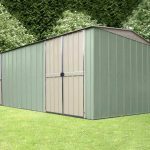 Taking into account the all-round durability of the shed, its size and the fact it doesn’t need any treatments throughout its lifetime, we feel this model provides exemplary value for money. 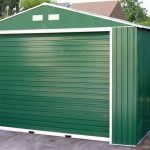 Final Thoughts: When you’re looking for a large storage shed, there are several things you want included with the cost. A good deal of storage space, durability, privacy and stability are just some of the main factors to consider. This shed rates highly in all areas, making it one of the best on the market. 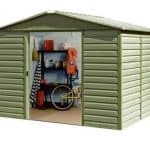 Its extremely great value for money and zero maintenance really makes it one of Walton’s best metal sheds.